The story behind the paper: From Greek drama via biocontrol and wrongly named commensals to tritagonists. – microBEnet: the microbiology of the Built Environment network. home New Papers The story behind the paper: From Greek drama via biocontrol and wrongly named commensals to tritagonists. The story behind the paper: From Greek drama via biocontrol and wrongly named commensals to tritagonists. Sometimes in science, a new idea and even a publication emerge from a serendipitous discussion over coffee. This is a short background on how Cosima, Mitja, and Florian discovered and defined the term “tritagonist”, which was recently published as a commentary in the ISME Journal (Link). In our case, Florian was writing a research project about “fungi that influence the interaction between pathogenic and antagonistic fungi and thereby improve biological control” and was unhappy with the cumbersome description, even in the title. Cosima referred to such organisms as water carriers, or water boys as in cycling or football, which did not seem an appropriate description in a scientific context. However, those supporting roles also reminded her of supporting actors or sidekicks in acting or story-writing and finally Cosima remembered having read the term “tritagonist” in a movie critique. Reading up on tritagonists and learning about their origin in ancient greek drama, Cosima and Florian both fell in love with the term. 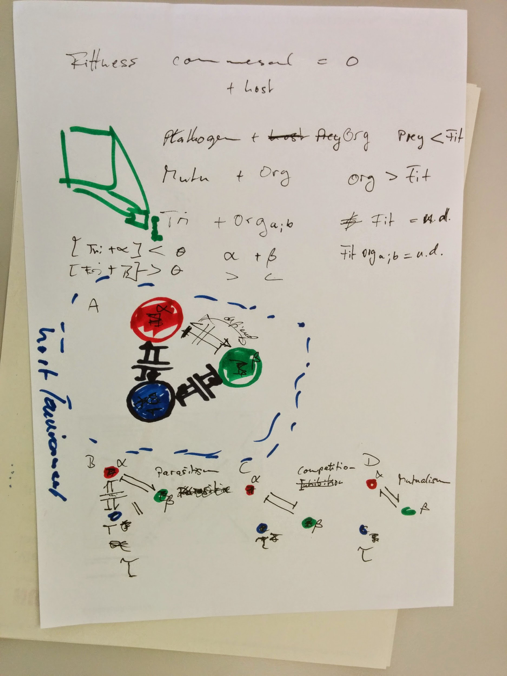 A few days later, during lunch, Mitja joined the discussion, learned about the “tritagonist”, and was immediately enthralled – and tried to broaden its use to microbial ecology in general. Within half an hour, and some more cups of coffee (except for Florian, he does not drink any coffee at all), the three of us started to elaborate on the concept, threw back and forth thoughts, and tried to define what a “tritagonist” is. We were all thrilled about the concept (and energized by all that caffeine) and immediately thought about ways to spread the term and publish the idea. 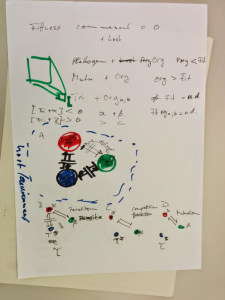 We met again to prepare a doodle (that in retrospect is really hard to understand) on how tritagonists potentially interact with their environment (figure 1) and started writing the manuscript using google docs. If you haven’t tried parallel collaborative writing you should; it is a cool tool and can be very efficient! It went so far that while Florian was just finishing up a sentence, Mitja was already editing the start of it. Sitting in front of your computer at home and watching letters and words magically appear and change on your screen is quite amazing! The efficient writing was followed by our anxious awaiting of the reviewer comments. Surprisingly, the reviewers neither bashed our idea, nor us nobodies for preposterously proposing a new word. Instead, the three referees were rather supportive and even encouraged us to extend and elaborate on our idea. So what is a tritagonist? According to our definition, tritagonists are organisms that regulate and affect the interactions among other species in an unknown manner. For us, all being microbiologists of some sort, tritagonists are mainly uncharacterized microorganisms, but the idea can of course be applied to any interacting organism. Most important is the fact that tritagonist implies a yet unknown function. It should really be obvious, but never the less important to be stressed again: the absence of a known function does not imply that there IS no function. In contrast, for microbes living in the same environment it is reasonable to assume a function! Tritagonists are thus clearly distinguished from commensals, which, according to their definition, do not affect their host. Unfortunately, the term commensal has been more and more misused, especially in recent years, and now seems to imply more or less what we would like to call tritagonists. The term commsal was coined by van Benenden in 1876, a time when people held vastly different views on nature and the interactions among organisms than we do today. Although bacteria had been discovered 200 years earlier by Antonie van Leeuwenhoek, this knowledge slumbered peacefully in text books. 1876 was just about the time when Pasteur disproved the theory of spontaneous generation and even before Koch formulated his famous postulates. In other words: it was long before people realized that microbes really rule the world. Originally, commensal meant “eating at the same table” – the picture that comes to mind is a land of milk and honey with a few commensals that feast on the inexhaustible food supply without interfering with each other. Today, this analogy reminds us of fairy tales and children’s books, but in 1876, nature may have well been considered a boundless resource. In science, commensalism is defined as a type of interspecific interaction that benefits one species, the commensal, and leaves the other species, the host, unaffected. Nowadays, commensals can cause all kinds of functions in their hosts, including infection, immune responses or tissue degeneration, which are thus, strictly speaking, cases of Contradiction in adiecto. The definition of a commensal as an uncharacterized microorganism WITH a function towards its host is so widespread, that it may be the easiest to just update its definition. However, we think the term commensal should be kept as it is, with its original definition, because it is well possible that commensal interactions do occur and the concept is useful for theoretical and mathematical models. Consequl a better word, one that implies a function, is useful and worthwhile. Especially in projects where one seeks highly active microbes it is really unfortunate to name them commensal – a term used to designate organism WITHOUT impact! Why would you spend money and precious research time on organisms if they exhibit no import role? We hope that the definition of tritagonists will help to intensify the efforts (and flow of research money) towards the understudied fractions of bacterial diversity at least in providing a simplified wording as in Florian’s awkward title problem. If we have caught your interest, please head over to the ISME Journal and have a look at our text (it is a fast read of only three pages published under open access policy). Of course we would be most happy if you adopt the tritagonist in the context of your own research. If you do so, it would be great to let us know as we are thrilled to learn how and in what context tritagonists are useful. If you do not agree with our definition and our proposition to use the term we would also be interested in discussing with you and welcome you to drop us a mail. @phylogenomics Also love this story & can now end my rant against general designation of gut microbes as "commensals." They're tritagonists!